We are very excited to share this update on Thanathip! She is the first woman we taught to make earrings, all of the earrings on our website are made by her. She has struggled in life and has been forced to resort to drastic means to provide for her mother and daughters. Since teaching her to make earrings, we have been training her to sell and market her products. 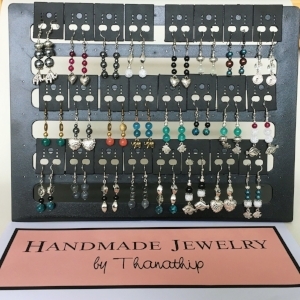 We have provided materials to make earrings and recently provided materials for branding and selling her products. She is now selling her earrings in the local markets. With our help, she is also reaching out to hotels in central Thailand to sell her earrings in their gift shops. The gift shops are more likely to buy from her because her jewelry is being exported to the USA and Canada. Thanathip's story is a perfect example of how our approach is equipping women to escape poverty and trafficking. We equipped her to launch her own business and became her customer. The profit on the large orders we've made have provided funds for her to live on as well as invest in her business. Additional training on branding, sales, and marketing have helped her to expand her business so that she is not dependent upon Freegrance as her only customer. She is now able to capitalize on the status that exporting her earrings to the USA and Canada provides, so that she can increase her sales locally. When you shop Freegrance, you equip us to empower Thanathip and many others like her. Shop our luxurious natural soaps and beautiful earrings today!